7am - Did you read in yesterday's Blog about what happened to MsScampy's floor? It is sooooo terrible! Everybody on The Team is feeling very bad for poor MsScampy! 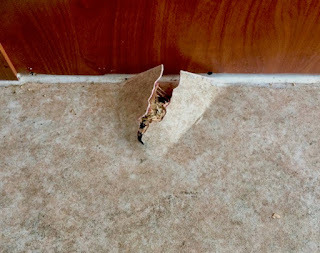 PS: The damage that must be repaired, is only to Scampy's floor. The mess to plumbing and electrical that was shown in pics in yesterday's Blog post, is not necessary to fix. I plan to repair the floor myself during my stay at Jojoba. His mpg has been declining over the last couple of months. I figured that this reduction in mpg was due to Little Honda needing some mechanical work. Tune-up perhaps? Anyway, after speaking on the phone with two highly rated shops, my figuring changed! Now I believe that the mpg reduction is due to towing MsScampy. I spent over an hour calling around in order to come to this conclusion. To make sure that MsScampy is welcome to camp in Jojoba's dry camping area, we phoned the office. It is OK! The office gave the code to open the entrance gate, in case I arrived at Jojoba after 4pm. I was positive that I would arrive by 2pm. Boy! Was I wrong!! I never arrived. Early this morning I checked Scampy's battery condition with a hydrometer. I became concerned because even though we have been driving, the specific gravity reading has been dropping. This drop convinced me that the Honda eu1000i generator that I held off buying, should be bought very soon. About two hours was spent online searching for a dealer that had this Honda generator in stock. Couldn't find one! We paid about $130 to install a cable in Little Honda that would carry charging current for MsScampy's battery. However, the charge from the Honda only does a tiny amount of charging. We might be able to get by without a generator for a day or so. But not longer! Honda eu1000i generator that we wanted. It was getting toward dusk when we stopped at an America's Tire Store in The City of Temecula to have Little Honda's tires rotated and inflated to proper pressure. We have made our Nite Camp in the City of Temecula. Even though our Nite Camp is close to Interstate 5, there is very little traffic noise here. This should be a quiet Nite Camp after 11pm, when we believe local traffic will die down. Tengo muchas cosas que hacer. No puedo salir area de Municipio de San Diego pasa dos en la tarde. Despues cena, escribire en mi Blog que yo hecho. Hi George, What was the actual damage. Saw the pictures but still don't understand what happened. As I'm sure you know, a little glue and some heavy weight on this will probably fix it acceptably. I have been sooooo busy all day, that I was not able to Blog about what you ask. After I finish supper, I'll answer your questions in my next Blog post. Hi George and Team, I want to share with you a memory of a visit I made to a place near you . Not exactly sure of the location, it was many years ago. I visited my Mother and Grandmother when they lived in San Diego. We rented a Tioga. My Wife, myself and 3 year old daughter took them in the rented RV and made a big loop up to Disneyland then back down the PCH. After that trip I wanted to get a Tioga just like that. It took 10 years but I got one. Now I like my Winnebago better then the Tioga but that's not what I wanted to tell you about. We went to a day spa place called Glen Ivy. It has an RV park next door and the actual spa nick named club mud, has hot tubs, massages, and mud baths. It was really fun to spend the day there. Not even sure if it still exists. Any way, great to hear of your travels and improvements.